Eugene Francis Savage (March 29, 1883 – October 19, 1978) was an American painter and sculptor known for his murals in the manner made official under the Works Projects Administration. He also is known for his work on the Bailey Fountain in Grand Army Plaza, Brooklyn, New York and the 'Alma Mater' mural featured in the Sterling Memorial Library on the campus of Yale University located in New Haven, CT.
Savage was born in Covington, Indiana. In 1915, while studying at the Chicago Art Institute, he won the Rome Prize in painting, enabling him to study at the American Academy in Rome, where he received a bachelor of arts degree. Later he received Bachelor of Arts (1924) and Master of Fine Arts from Yale University. Savage subsequently taught at the Yale School of Art and Architecture for twenty-eight years, where he was the Leffingwell Professor of Painting & Design. "Morning", the work with which Savage won the Rome Prize in painting. Savage's training in Early Renaissance techniques strongly influence his style. He was also strongly influenced by Thomas Hart Benton. 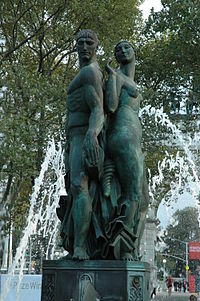 Other contemporary influences on his public art were his Latin American contemporaries Diego Rivera and José Clemente Orozco. Savage's influence was extended by his service on high-profile arts committees. While acting as a member of the Fine Arts committee of the American Academy in Rome, he ensured, though not a member of the jury, that a generation of winning artists were painting in the manner of Thomas Hart Benton or Savage himself. He became an Associate Member of the National Academy of Design, 1924 and National Academician, 1926. Savage also served on the U.S. Commission of Fine Arts from 1933 to 1941 and was a member of the American Academy of Arts and Letters, to which he was elected in 1936. Savage was commissioned by the Matson Navigation Company to paint nine 4 by 8 foot Hawaiian-themed murals in Hawaii. They were completed in 1940, but never installed in the company's ships, which had been converted to troopships. In 1948, lithographs based on these murals were used as menu covers on Matson's flagship, SS Lurline. Murals by Savage are on the campuses of Purdue, Columbia and Yale Universities. At Yale, he oversaw the decorative painting of Sterling Memorial Library and painted the library's Alma Mater mural. His work also features in government buildings in Connecticut, the Elks National Veterans Memorial in Chicago, the new Post Office Building (now William Jefferson Clinton Federal Building) in Washington, in Indiana and the renovated Court of Appeals Hall, Albany, New York (1959). He also did the Great Hall murals in the Hall of State at Fair Park for the 1936 Texas Centennial Exposition in Dallas, Texas. After World War II, Savage designed and installed the colored glass mosaic map at the American Cemetery in Épinal France. The mosaic depicts American and Allied military operations of Operation Dragoon from the landing in southern France on 15 August 1944 to the junction with Allied Forces advancing from Normandy on 11 September at Sombernon, near Dijon; and their subsequent advances after turning eastward, crossing the Rhine and sweeping across Germany to meet with the spearhead of the U.S. Fifth Army south of the Brenner Pass. The mosaic, 54' feet long and 14' feet high, was designed utilizing data provided by the American Battle Monuments Commission. The map is laid out in perspective as seen from the south; consequently, the lines of the longitude and latitude are tilted to accommodate the map to the proportions of the room. Thus, north is toward the upper right instead of vertically upward. Symbolically, the figures on the semi-circular wall depict the Spirit of Columbia leading the Army, Navy, and Air Forces to the landings on the south coast of France. The final victory is symbolized by the Angel of Victory with laurel branch above the central altar; a group composed of trumpets; the American and French flags emerging from the clouds of war and the outstretched hands of women who offer flowers as tribute to the victors. In the border of the map are the insignia of all military units of division size or larger that participated in ground operations in the region. The 14'x4' foot 4 panel oil on board study for the glass mosaic at the Epinal American Cemetery and Memorial currently hangs at the Military Heritage Collection of North Texas 35 miles north east of Dallas, TX in Nevada, TX. In other media, he provided illustrations for Coningsby Dawson's Christmas Outside of Eden. 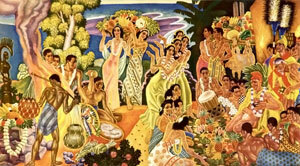 In 1938 the Matson Lines commissioned him to paint murals depicting native Hawaiian life, which were later adapted for menus and other memorabilia. Berenson, Richard J. (ed), The Complete Illustrated Guidebook to Prospect Park and the Brooklyn Botanic Garden, New York, Silver Lining Books, New York, 2001, ISBN 0-7607-2213-7, pages 32–36. Carnegie Corporation, On Art Education. (1929.) New York: Carnegie Corporation. Lancaster, Clay, Prospect Park Handbook, New York, Published for Greensward Foundation by Long Island University Press, 1972, ISBN 0-913252-06-9. Purdue University, "The Spirit of the Land Grant College" mural, 1961. ^ a b Fort, Ilene Susan; Quick, Michael, eds. (1991). American art : a catalogue of the Los Angeles County Museum of Art collection. University of Washington Press. p. 462. ISBN 0295970278. ^ The date is sometimes incorrectly given as 1912. "American Academy in Rome, Society of Fellows". ^ "Prix de Rome". Time Magazine. 23 May 1932. Retrieved 15 April 2014. ^ Wageman, Virginia; Freshman, Paul, eds. (2004). Paintings and Sculpture in the Collection of the National Academy of Design: 1826–1925 (1st ed.). Hudson Hills. pp. 492–493. ISBN 9781555950293. Retrieved 6 April 2014. ^ Because of his purported influence, awardees were known as "little Savages", according to TIME (1932). ^ "Eugene Savage: festival of the Sea". ^ "Eugene Savage: Self-portrait". Hamilton Auction Galleries. ^ "Deceased members". American Academy of Arts and Letters. Archived from the original on 26 July 2011. Retrieved 14 April 2014. ^ Luebke, Thomas E., ed. (2013). "Appendix B". Civic Art: A Centennial History of the U.S. Commission of Fine Arts. Washington, D.C.: U.S. Commission of Fine Arts. p. 554. ^ "Discussion Board for Eugene Savage". AskArt. Retrieved 15 April 2014. ^ "Public Art at Yale". Yale University. Retrieved 15 April 2014. ^ Lynn Blocker Krantz, Nick Krantz, Mary Thiele Fobian, To Honolulu in Five Days: Cruising Aboard Matson's S.S. Lurline 2001. This page was last edited on 14 February 2019, at 20:15 (UTC).